The US ambassador to the UN, Nikki Haley, has vowed to "call out" states backing North Korea and its nuclear ambitions, as tensions continue. "You either support North Korea or you support us," she said, suggesting some countries were failing to adhere to UN-imposed sanctions. Her comments came ahead of an emergency meeting of the UN Security Council. The council on Monday unanimously condemned North Korea's latest missile test and warned of new sanctions. North Korea said the missile it had tested on Sunday was a "newly developed ballistic rocket" capable of carrying a large nuclear warhead. It flew some 700km (435 miles), reaching an altitude of 2,000km and landing in the sea west of Japan. South Korea was unable to verify the claims. 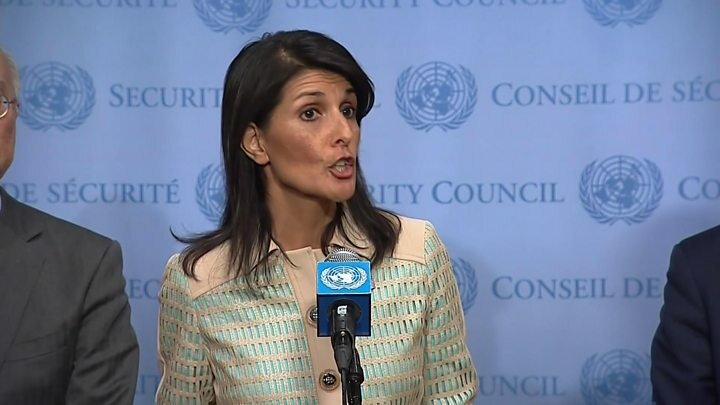 Speaking before a closed-door Security Council meeting on Tuesday, Mrs Haley warned countries giving their backing to North Korea to stop or face the consequences. "If you are a country that is supplying or supporting North Korea, we will call you out on it. We will make sure that everyone knows who you are and we will target those sanctions towards you as well," she told reporters, flanked by the UN ambassadors to Japan and South Korea. Washington, she said, would consider talks with Pyongyang only if the country halted all nuclear and ballistic missile tests. She confirmed that the US and China - North Korea's only ally in the region - were working together on a new Security Council resolution targeting North Korea. "Sanctions is something that we are looking at and we are going to continue to see where that takes us." In a statement on Monday, the 15-member council demanded that Pyongyang conduct no further ballistic missile tests. The Council has imposed six sets of sanctions against the North since 2006. 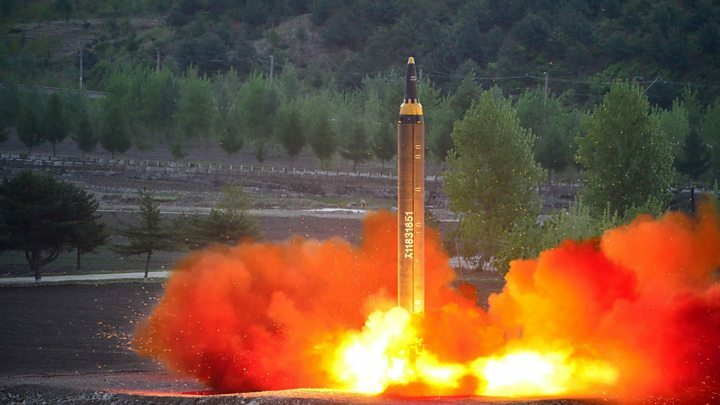 But it remains unclear whether it has the ability to make the weapons small enough to be mounted on a rocket, and it has never tested an intercontinental ballistic missile (ICBM) which could reach, for example, the US.